Sony launches Xperia Z1 waterproof flagship phone | What Hi-Fi? Sony has announced the introduction of the Xperia Z1 at IFA 2013, the latest addition to the company's premium Z series of products. 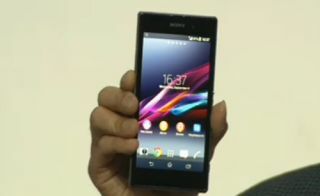 The Sony Xperia Z1 has a 5in screen, 1080p resolution display, and sports the very latest Android 4.3 operating system. Featuring a 20.7MP camera, the Xperia Z1 phone comes in a slim, waterproof case carrying on the design aesthetics of the company's Xperia Z smartphone and Xperia Tablet Z. Built from a solid one-piece aluminium frame with tempered glass on the front and back, the Xperia Z1 also includes a fully integrated Qualcomm Snapdragon 800 processor with 2.2 GHz quad-core CPU and 4G LTE connectivity. Sony claim that the Snapdragon processor boasts the latest GPU technology that will deliver incredible graphics, 3D games and videos. Sony's Battery STAMINA Mode also returns having featured in the Xperia Z, ensuring the 3000mAh battery automatically turns off functions to conserve power, restarting apps only when you need them. The Z1 will also be compatible with a number of products intended to enhance the portable experience. Sony's SmartWatch 2 can be used as a second screen, with messages, notifications and calls handled through the device. The Miracast Wireless Display IM10 will mirror your smartphone display through your HDTV or projector. RAM for the Z1 is specified at 2GB with flash memory totalling 16GB. Expansion, up to 64GB, is available through a microSD card. A global launch date of September 2013 has been confirmed, with the phone available in black, white and purple variants. No word on a price as yet.